The Gentleman Crafter: Graphic 45 Ladies Diary Roll Top Desk Give-a-way! Please join me over at Graphic 45's blog this morning to see one of my projects for CHA, The Ladies Diary Roll Top Desk. While you are there, check out another incredible project by the amazing Nicole Eccles. A really cool day of beautiful crafts. 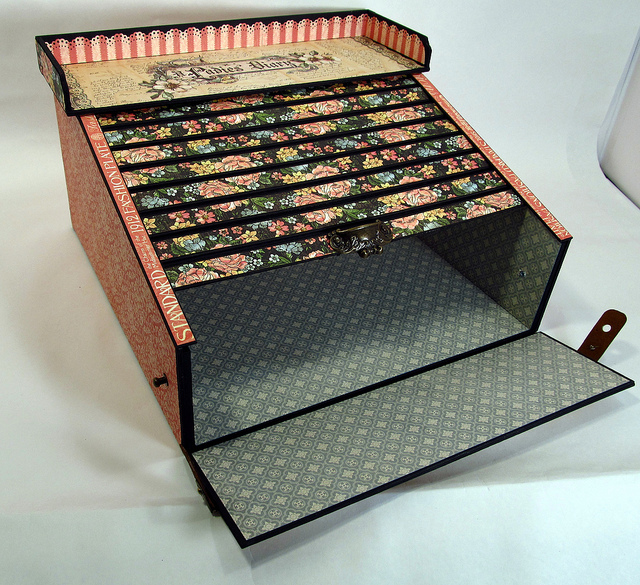 The Ladies Diary Roll Top Desk will be the give-a-way prize by Graphic 45 this week along with an 8x8 pad of Ladies Diary. Please check Graphic 45's blog for the details. 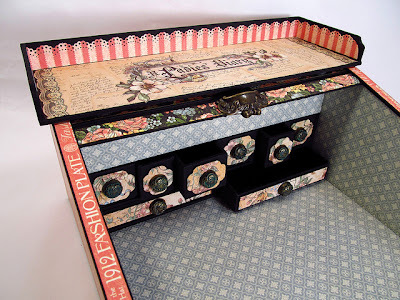 When I first saw this collection of papers from Graphic 45's Ladies Diary, I knew immediately that I wanted to make some sort of feminine writing desk. In my mind, I thought of a desk in front of a window in a grand manor house with a lady sitting writing notes in the morning light. How's that for DRAMA! LOL! Too Much Downton Abbey huh?! LOL! The desk was made from...you guessed it...medium weight chipboard. I doubled the thickness of the chip for added integrity. A trayed back sits atop the desk to hold pens and writing instruments. The desk opens by rolling the top back with the new Graphic 45 Antique Pull into it's hidden compartment. The hinged straps on the side unhitch to reveal the insides. 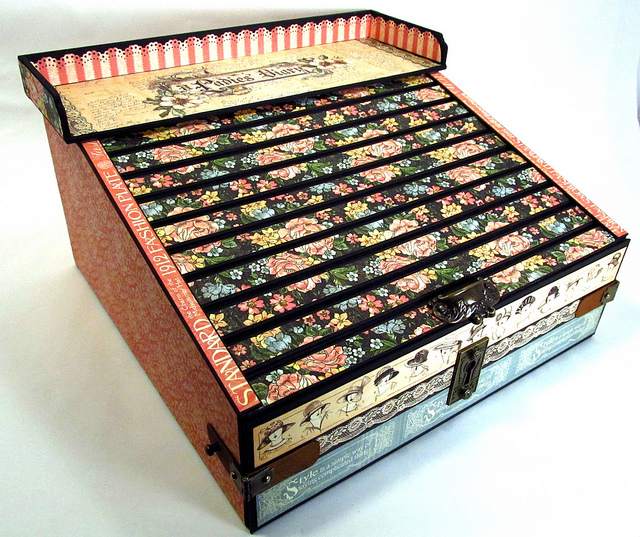 The rolled top covered with the beautiful "Focal Point" paper from the Graphic 45 Ladies Diary Collection. This black pattern is one of my favorites in the collection. So pretty. The front panel above also features another new staple from the Graphic 45 line up, the metal key plate. Love them! The open space inside is for writing notes or journal entries. The eight functional drawers are perfect for notes, stamps, paperclips, etc. The desk size is about 12 x 8 x 12 when closed. Hope you enjoyed the tour of the desk and some of it's highlights. Good luck to you all this week for a chance to win The Ladies Diary Roll Top Desk from Graphic 45's blog. Hope you like it! Me me me... running over to G45 NOW! I was blown away the first time this was shown. I am still trying to figure out how you made the top roll out of site. Off to G45 for a chance to win it and maybe see how you did it. Hope you have a tutorial for this. I love your work, Jim....so elegant, yet practical. I'm always impressed with your paper engineering skills! Jim.....anyway you could be persuaded to do a tutorial on the ladies desk???? Pretty please with sugar on it....or whatever they say in Texas! Just Beautiful! The mechanics alone would confuse me - you are so creative and talented! Astounding! Where do you find the time to create these lovely masterpieces. You are so uber talented...keep on inspiring! Jim I read on you blog that you like boxes of all sort. Well, so do I. 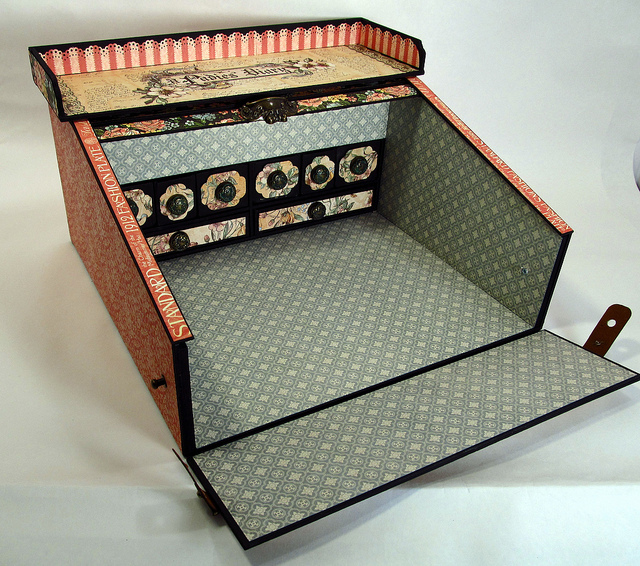 You have created such a beautiful roll top desk that is functional too. I check your blog daily to see what you create. You are very talented and inspiring. I too would loooovvve a tutorial. I have made a creation of yours and your tutorials are great. Can't wait to see what is next. Jim, I just about fell off my chair, the first time I saw this!!!!!! What a perfect project for this beautiful paper. As always, I to would love a tutorial. Can't get enough of your wonderful projects Jim!!!!!! I just love your imagination!!!!! Jim, again....another beautiful project. I hope that we are going to see how you made this. I love all of your projects...each one is more beautiful than the last. I have no access to G45 papers locally. And I truly "lust" after your projects. I will have to go on a journey to another city to try and find the paper so that I can make this project...if you have a tutorial. Thank you so much for sharing your genious with all of us! This is so stinkin' cool! Another masterpiece!!! What can I say that hasn't already been said?!?!?! 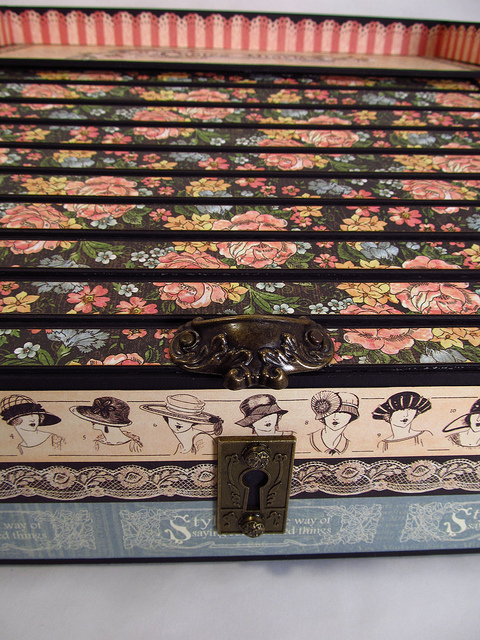 The Ladies Rolltop Desk is totally OVER THE TOP!!!!!! I would love to know how you made the rolltop mechanism. How in the world do you figure these things out...you amaze me!!!! Off to G45 with crossed fingers, toes, eyes and whatever else I can figure out how to cross!! This is "stunning" and I am so hoping to win this. My jaw dropped the first time that I saw it. Thanks for the chance to win this beautiful piece. This is just stunning!! I saw it at CHA and I was in awe of the total project...heck the entire Graphic 45 booth was drool worthy!! Oh Jim, this is fantastic! I want one! Where do you get the configuration boxes? I'll google it of course.... And I subscribe to the G45 blog so I'll be getting to it soon! And Congrats for having the blog project today! Jim, your roll-top desk is just amazingly beautiful and I've no idea how you got it to work either! I know there's a lot of stiff competition, but I'm off to the G45 blog now to enter as well. I'd love to actually own something that you had made as you are so talented! great job Jim, you are their best designer. wow jim, what a great idea. you are definately an out of the box thinker. tfs i'm heading to grafic 45 to see if i can be the lucky one! Oh My Gosh! Jim, I am speechless! This desk is magnificent! I....NEED....THE...PATTERN.....YESTERDAY!!!! WOW...WOW,,,and WOW !!!! OMG Jimbug, this is over the top, spectacular and AMAZING !!! This is absolutely the most amazing project you've done so far, and believe me - they've all been amazing! Hi Jim, I've been so excited ever since you mentioned that G45 was going to give us a chance to win this magnificent creation. I can't quite believe that you are willing to part with it. Thank you so much for the chance to win & for inspiring me with all your amazing projects. Hello Jim. I'm sure you are getting tired by now of hearing how great your Ladies Diary Roll Top Desk is--however, that is not going to stop me from repeating all the other comments! You truly do craft uniquely awesome projects. I love your choice of paper for the roll top part; it is perfect. 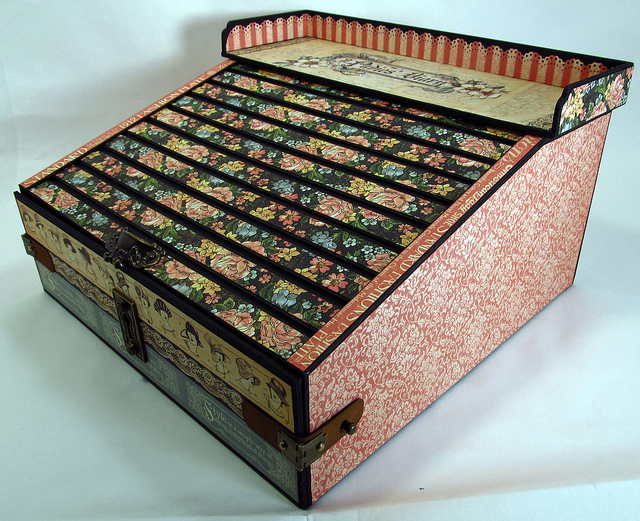 And, as if having the roll top wasn't enough, you fashioned eight drawers in addition to making everything fit into an outstanding piece of elegant paper crafting delight! Thanks for sharing your enormous talent with us. This roll top desk is gorgeous... you just keep getting better and better. I look forward to my "trips" here as I always walk away greatly inspired! And as talented as you are, you're equally as blessed with the most delightful sense of humor. Thanks for sharing both with us! Hi Jim. Love this desk more each time I see it. So glad we have a chance to win it. Thanks as always for sharing. What an amazing creation! I now need to think this thru and see if I can emulate you!! I think this one and the traveling wine case are my favorites, LOVE LOVE LOVE this roll top, are you going to let wondering minds know how you did ths, or a tutorial. maybe. Wow, this is one of the coolest projects I have seen lately!!! thanks for sharing!!! I have translated your post to portuguese, if you don`t mind, and shared it on the blog http://www.lanuance.com.br/blog/mini-papeleira-usando-papeis-da-graphic-45/, mentioning your blog. Thanks, I loved this project!